Who is the target audience for your Company/Business/Farm? What kind discounts do you offer your customers? Any special monthly or yearly sales events? We offer huge discounts on new/used cars and trucks as well as factory rebates and 0% financing through Ally Bank. Farm Bureau members receive an extra $500 rebate on most trucks above all other rebates. We support local youth leagues, we also sponsor the Hole-in-One Gold tournament, and we also hold events at the dealership for local schools. We have installed a new alignment machine, a new tire machine, and a new smog machine. We are now your one stop full service dealership. 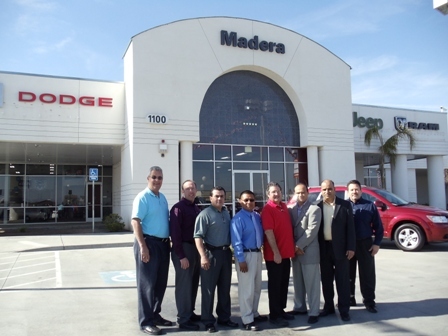 We at Madera Chrysler Jeep Dodge are concerned with water issues because we also farm and understand the issues. We hae supported the water issues from day one by attending demonstrations in Sacramento with local water coalitions. The value I receive from Farm Bureau membership is huge most of my new truck customers are Farm Bureau members and I am able to save them extra money on buying dodge trucks.